Experience Centers — Corbett Inc.
With Experience Centers in Norristown, PA, and Pittsburgh, PA, and a traveling bus that tours the region, Corbett Inc. makes it easy for our prospective clients to experience first-hand the numerous aspects of a successful facility project. Displaying much more than furniture, our centers are designed to integrate technology, flooring, architectural walls, height-adjustable desking, and flexible seating. These centers focus on educating, stimulating, and motivating our clients and internal associates, and provide an ideal platform to evaluate upcoming facility decisions. Our vignettes range from corporate settings to learning environments, and healthcare interiors to student housing, with state of the art corporate theater and video conferencing technology, making it easy to visualize an upcoming space or facility project. 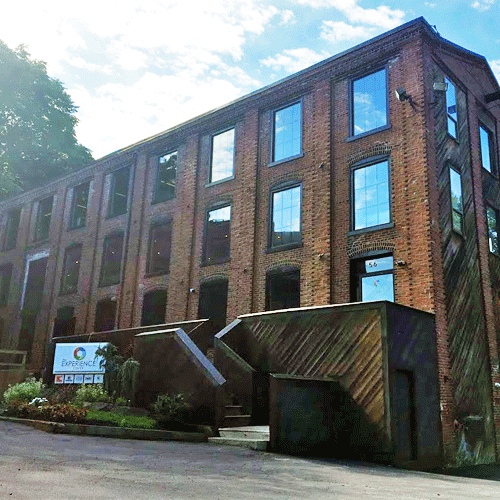 In 1979 William Corbett Jr. purchased the Watts Woolen Mill located along the Schuykill River in Norristown PA and began the undertaking of major renovations. William Corbett III took over the role as leader of the company after his father lost a battle with cancer in 1981, and has since carried his father’s passion for both building a strong company and completing the renovation work on the Watt’s Woolen Mill. Nearly 40 years later, the facility is as impressive as ever and continues to be a destination for product expertise, ideation, and industry events. Located on Greentree Rd. in Pittsburgh's West End, the Experience Center is a church built in the early 1900's. Recent renovations provide a unique space for events and vignettes showcasing key areas of commercial space trends and educational elements. The friendly West End is Pittsburgh’s emerging "hot-spot" and is easily accessible to all major highway systems as well as bus service. Our mobile Experience Center (affectionately known as “The Bus”) conducts formal tours throughout the territory and is available to outfit as-needed for large project opportunities. A great way to get hands on with our products – right at your doorstep!